The revered post and beam design of the Streng brothers mid-century modern home was built over 50 years ago, and while the appeal of their design has stood the test of time, the exposed beams have not. The beam’s original projection was 7 to up to 12 inches, and due to decay from years of exposure, most all have been cut back to the fascia leaving it exposed to the elements once more. Many Eichler and Streng homeowners are choosing to increase the value of their mid-modern home by restoring the exterior aesthetic, and for good reason. The Eichler and Streng home designs have become historic collector’s investments! For those mid-century modern enthusiasts, RETRObeam provides a simple and affordable solution to protect and restore the exterior aesthetic of post and beam architecture. RETRObeam has been carefully designed, and quality crafted to fully encapsulate the exposed beam while extending the look of the beam to its original projection of 7 to up to 12 inches. Each RETRObeam is measured with a tolerance of an eighth of an inch to create a balanced, seamless look. RETRObeams are water proof! Each projecting beam of your home will be carefully measured. The end cap measurements are submitted to a local manufacturer. Each RETRObeam is welded together with fourteen gauge steel to provide water proof protection. Before installation, each RETRObeam is cleansed, primed, then painted to match your existing trim color. 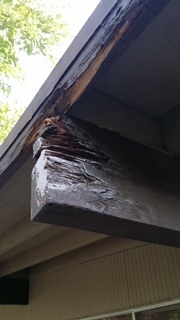 Our technician carefully removes the fasteners connecting the fascia to the existing beam, then simply slips on the RETRObeam. The RETRObeams are attached with minimal amount of fasteners while maintaining the original structural integrity. Contact us using the form below, and we will get back to you as soon as possible. Please note: RETRObeam restoration may not be an effective restoration technique for every home. To find out if RETRObeam is right for your home, please contact us for a consultation. RETRObeam is produced and designed by RMZ Design (CSL #763174), serving the Davis area for 25 years.